Artwork Panel: 28.4cm x 41.6cm ≈ 11¼" x 16¼"
Silk/Brocade: 37.4cm x 103.9cm ≈ 14¾" x 41"
Width at Wooden Knobs: 46.4cm ≈ 18¼"
This is a mechanically-printed reproduction of a very old Japanese woodblock print. This was made months ago, rather than centuries ago. 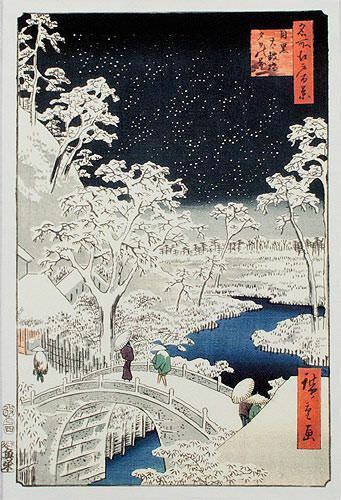 This depicts a snowy scene at Taiko Bridge in Meguro, Tokyo. This was part of the series, "One Hundred Famous Views of Edo". This was number 111, part 4, depicting Winter. Literally: Meguro Taiko Bridge, Sunset Hill. Contrary to popular belief, woodblock printing (and in a way, the first printing press) was invented in China. 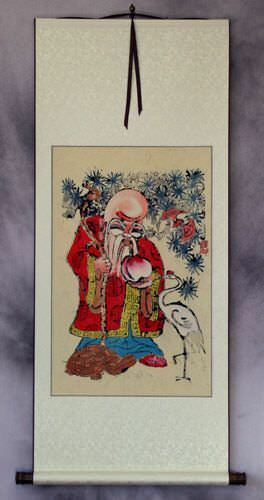 Both artwork and whole books were produced in China using the woodblock print technique. Much of this artwork and printed books made their way to Japan. Emulating the methods and adding to the style, Japanese artists took woodblock printing to the next level. In Japan, wood block prints are known as or "Moku Hanga". Most were produced during the Edo period (1603–1867). To put that in perspective, that's from before what is now the USA was even a British colony, to just after the Civil War. Some artists continued creating prints into the early 1900s. At that time, Japanese artists would create "template paintings" with detailed images of "everyday life" scenes of Japan. Some of these "everyday life" or (Ukiyo-e), which translates as "Floating World" images, depict battling Samurai, beheadings, and even prostitution. This leads you to believe that "everyday life", was rather exciting in ancient Japan. However, most Ukiyo-e prints were more tame scenes of everything from women washing clothes, to men writing poetry. After creating the template, the artist would then have another artisan carve large blanks of wood with those images. The carved wood blocks were then given to yet another artisan, known as an "inker". The inker would then carefully apply wet ink or colorful paint to the various carved surfaces. A sheet of handmade paper was then pressed over the inked woodblock to create the final print. The process was laborious, but not as tedious as hand-painting hundreds of copies from scratch. If this was an "original" Japanese woodblock print, dating back to the Edo period, the price would be anywhere from $800 to $20,000. Just to be clear again: This is a reproduction. The quality of this reproduction is very good, but a true expert will spot this as a reproduction after examining it. I use handmade kozo (mulberry) paper - the same kind of paper that Japanese woodblock print makers used centuries ago. The pigment-based inks are archival and UV-resistant. In independent laboratory testing the giclée prints created with this ink should survive 95 years with no signs of fading, if not in direct sunlight (most hand-painted artwork fades before that). I figure you'll get a lifetime of enjoyment if you take good care of this wall scroll. I spend hours making sure the colors are vibrant, and touching up areas that might be damaged or missing from the old original print. The result is very close to what the woodblock print would look like if you could go back in time to the Edo period, and buy it from the artist's studio in old Japan. For years I tried to find a printer that could handle handmade paper without wrinkling, jamming, or clogging print heads. I bought and tried several giclée printers valued at up to $15,000 each. They gave mixed results, I finally found the quality I was looking for in a brand-new Canon imagePROGRAF PRO-2000. This printer has 18,432 nozzles and 12 ink tanks. That's 12 ink tanks costing up to $294 each. With the price of the printer at $2,695 it was a total investment of about $6,000 - which is not a price tag for the faint of heart. I have to use this printer in the USA to create the print, as I can't get a license for such a machine at my other studio in Beijing (The Chinese government fears that I will make counterfeit Chinese currency, or Pro-Democracy propaganda posters with it). After carefully printing and inspecting this artwork, I sent the raw print on kozo paper to my workshop in Beijing where it was built into a handmade wall scroll. 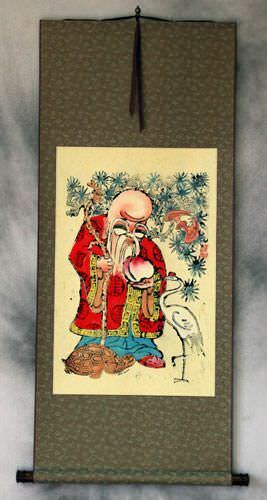 This makes it ready-to-hang (no expensive framing needed), and gives the whole piece a very traditional Asian look. Because the artist of this piece passed away long ago, and the original artwork is over 100 years old, there is no copyright. However, in some cases, I have paid a license fee to the owner of the original Japanese woodblock print for access to create the digitized image. In a few cases, I bought original 200-year-old woodblock prints and drum-scanned it at high-resolution. All of this effort on my part means you get a really beautiful Japanese woodblock print reproduction, for a very affordable price. I am not sure I will ever make a profit on these (I would need to charge about double this price if that was the goal), but I really like to make unique Asian artwork affordable and accessible to everyone. Want a customized wall scroll or custom-sized print? Just contact me! I can print this larger, on the paper texture of your choice, and give you whatever silk brocade colors you want. Ready-to-frame prints can be delivered in a few days. However, it does take several weeks for custom wall scrolls. Either way, it's worth the wait if you want something really custom and unique.